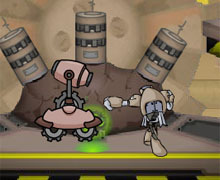 Terrascape is a side-scrolling fighting/platforming hybrid that came out in July 2007 as Aaron Worrell's follow-up to the critically acclaimed fighting game Newgrounds Rumble. Terrascape had a lot to live up to, and though it succeeds on many levels, at the end of the day, it's clear that the game needed more time in development. The graphics in Terrascape are very nice. Everything is well-drawn and animated, with some awesome backgrounds and cool attacks. Honah Lee and the Rainforest are especially fun to look at. The music is not particularly good, but it's serviceable. The title music is probably the worst of it, as it sounds like a high school kid who has just figured out how to make chords on his Casio. With the variety of characters, spells, and environments in Terrascape, you'd expect this to be a pretty phenomenal game. It isn't, though. The main problem with is that it feels like an attempt to squeeze the Newgrounds Rumble game engine into a game of an entirely different genre, and that affects the game's playability. The platforming parts, especially, are borderline awful. The controls feel sluggish and imprecise, and it isn't always clear what parts of the level count as ledges and which don't. Accordingly, it is very, very easy to fall. The fighting is much better, but it also leaves something to be desired. For example, when two enemies are standing directly in front of you, your attacks will only hit one of them, allowing the other to pummel you at his leisure. This, in turn, makes the sluggish controls feel ten times worse, since you can't simply punch and then move out of the way. Also, magic in the game doesn't seem like a viable thing to rely on, since you can only hold 3 spells at a time, and have no control over which ones you get. The bottom line: Terrascape is an attempt to force the Newgrounds Rumble fighting engine into a game for a different genre, with decent but ultimately uninspired results. It's much too short, and the gameplay just isn't good enough to save this from a mediocre score. 7/10 - "Not Terra-ble, but should have been given more time in development"